I love my haters. I send kisses of mercy to all my Judases. I bless those who’ve tried to curse me.I forgive those who’ve wronged me and ask for forgiveness to those whom I may have wronged. To those who’ve rejected my gifts I declare the abundance of gifts to you. To my enemies who are really my friends but don’t know it yet. Repeat this: [Enter your own name here] is going to be so outrageously and contagiously blessed that we are going to be blessed as well! Thank you! I release the revelation of God’s securing love upon those who are jealous of or intimidated by me. I speak long life to my enemies that they live long enough to see me fulfill my God-ordained destiny. To all those who’ve put time in to destructively criticize me and ruin my reputation, I say thank you thank you and thank you again for the free advertisement. To those who thought I was perfect, well, sorry to disappoint you, but you’re not either. I pledge to not hold you to a standard that I can’t live myself. For all the hard labor, covert press releases, and tireless hours of deformation of character; I say God’s blessings of purity, prosperity, and longevity be yours. To those who are loquacious and pretentious towards me, you get the credit for driving me to the Lord. I will exceed the opinions and expectations of others including my own, because my expectations now, are of Him, not them. I choose to walk in love with the unloving. I choose to surpass the past. I am determined to not allow the devil, myself, or anyone else, to hold me hostage to my past. For all those who’ve prophe-lied concerning me. May God bless you to get it right the next time; because what you meant for my evil, God designed for my good! I release this with the love God gave to me in Yeshua’s name and Yeshua’s authority! Amen….and the winner is LOVE! Love it! A powerful lesson of love, forgiveness and perseverance to keep with me on my journey. Bless you for sharing. Thank you for sharing how the post affected you. It is good to know that it is making a difference. This is a fantastic post – really speaks from the heart and a useful tool for many-a-morning prayer. It really made me think about how I should love my haters – thank you for sharing. Thank you Crazy Christian Mummy for stopping by and commenting. Glad that it has made you think. I’ve been wondering how to love a few of my enemies showing them as little good as I can. And you lavished good on them. You gave them long life and purity…I wanna be like you. =) That was an amazing prayer. The only thing I would add is Father forgive them they know not what they do. You have a wonderful heart. Thanks for sharing it. You are welcome. Your comments are appreciated. It is good to know that the prayer ministered to you. Love it!! took the words straight from my heart and mind!… I will be passing it on 🙂 thank you for sharing this insight…. Welcome to blogging. This prayer was birthed while crying out to God. It’s good to know it is ministering to you. We go through painful experiences nit only for ourselves but for others. Thank you for sharing. I thank you for this prayer of love for our enemies. I really needed to read this asking the Lord to give me new vision in the face of other’s persecution for who I am. God bless you richly. Thank you for reminding all of us to forgive one another as Christ has in turn forgiven us. You are stepping closely to the LOVE our Savior wants to extend to everyone. You are welcome. Forgiving others is our opportunity to show the love of God to those around us. Thank you for visiting and commenting. I mean… The LOVE our Savior wants US to extend to everyone! Yes, God’s love is to be extended to all! I love this especially because I’m 14 and have haters. I will be saying this prayer in Biology class. God bless. This prayer will change your life. Love is something haters do not understand and have no defense against. Love and abundant blessings to you, especially in Biology class! I so needed to read this. It brought a smile to my face bc i just found out that family members were talking negatively and sharing untruths about me and my family. One family member was there who I am close to defended me and came back and told me. I do not plan to approach the others bc I know the truth. But i do want them to know I want nothing but the best for them and always have, so it is hurtful that they felt a need to lie and spread untruths to make me look bad because I am living a blessed life and God is the center of my joy! So…blessed to read yr posts..Keep up the good job! Just wanted to thank you for taking the time to stop by my blog and for liking one of the posts. God promises to bless us when we bless those who curse us! Great prayer, quite encouraging! And may God richly bless you for blessing the unlovables! I also love the beautiful picture of the Northern Lights. What amazing colors. Thank you also for visiting my blog. I love the term – Prophe-Lied – that is such a well targeted expression. I love this, A truly inspiration. Now I’m hungry for more words of encouragement!! Thanks so much. Continue to let Yahweh use you to inspire others! You’re truly a blessing. Marietta, I’m happy that this post made your day! Loving your enemies is definitely the secret weapon! We need to ask forgiveness for not praying like this. Thanks for being a witness.in such a winsome way. Wonderful! Love works so much better than hate! So very true. Have you read my post Loving the unlovable? Yes, indeed! Just read your post. Praise God! 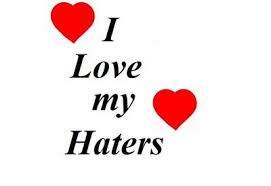 Love your haters. Amen! You are so right. Thank you so much for this insightful piece. Whenever my haters write to me, I thank them for their time…because they help me to grow spiritually and to learn to love them, as the Lord intended. You’re welcome. Love births miracles in ours and others. God’s love passes through us to others. Jesus would do the same thing. That is how God softens hard hearts and blind eyes. Love makes miracles in hard hearts. Gary, God bless you! Ah, if only I could live this out! Read this and be blessed, my friends. Thank you for the reblog! Blessings of loving your haters! Love ❤️ conquers all! Blessings of loving your haters ! Thank you for the post. It challenges all of us to higher standard of living for our benefit, too, because forgiveness is a healing spiritual posture. Thank you also for stopping by my blog. Have a blessed day.